We have information you must know before you buy the Accord. The carryover 2019 Accord is rolling in. Honda has tweaked its deals in April, making lease and financing offers regional instead of nationwide. The deals aren't nearly as attractive as the 2018 model's deals were, but we should see these come down over time. Offers listed here are available through April 30, 2019. All deals listed here are regional and for a Southern California location unless otherwise specified. Memorial Day is just over a month away, and Honda sometimes offers special deals on these types of holidays. Stay tuned for updates. Across the nation, buyers can get up to $750 in unadvertised incentives on the 2019 Honda Accord to help lower the MSRP. Remember, dealers can use these incentives as they please or even pocket them as profit, so shop around for the best offer. Separately, leases nationwide are eligible for up to $300 in lease cash on the 2019 Accord. Honda has made huge changes to its APR offers in April, making them regional with small variances between regions. Buyers in Southern California, Illinois, New York, and Nevada can get 3.9 percent APR for 36 months or 4.9 percent for 60 months. If you live in places like Georgia or Texas, the APR drops to 2.9 percent for 36 months and 3.9 percent for 60 months. Regardless of your region, you cannot combine these offers with the unadvertised incentive above. There are loads of 36-month lease offers on the 2019 Honda Accord. They start from $249 per month with $2,399 due at signing for the 1.5T LX trim. This carries a $316 effective monthly cost, making it a bad value relative to its MSRP. In areas favoring better APR rates, amounts due at signing are around $800-900 higher. Check out all the other 2019 Accord lease offers in the table below. 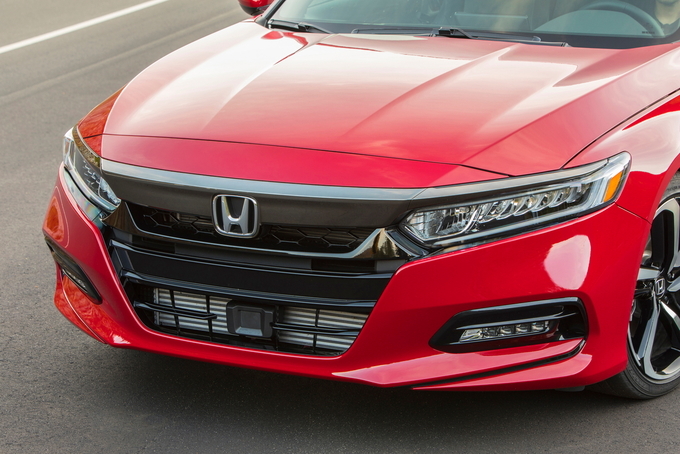 Being the king isn't easy, but the 2019 Honda Accord carries the crown with grace. 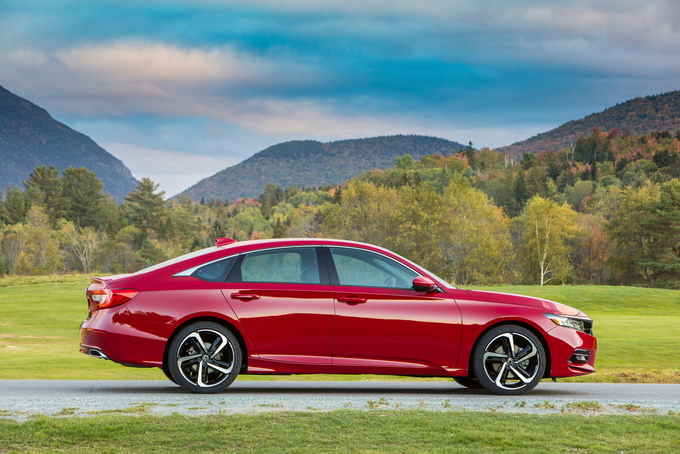 Drivers seeking a comfortable, usable, and well-equipped sedan will be hard pressed to find a better option than the Accord, which is backed up by impressive sales figures year after year. If the Accord's credentials as a top seller aren't enough to win you over, its handsome design, fuel-efficient powertrains, and excellent list of safety features should. After coming out as an all-new vehicle last year, the 2019 Accord returns without any notable changes. Two engines are offered for the Accord. The base motor is a turbocharged 1.5-liter four-cylinder engine that produces 192 horsepower and 192 pound-feet of torque. A continuously variable transmission (CVT) is standard for the engine, though the Sport trim can also be fitted with a six-speed manual transmission. A turbocharged 2.0-liter four-cylinder engine and a 10-speed automatic transmission are also available. That combination produces a healthy 252 hp and 273 lb-ft of torque. Fuel economy is best for the Accord when it's equipped with the 1.5-liter powertrain and CVT. The EPA rates this setup to get up to 30 miles per gallon city, 38 mpg highway, and 33 combined. 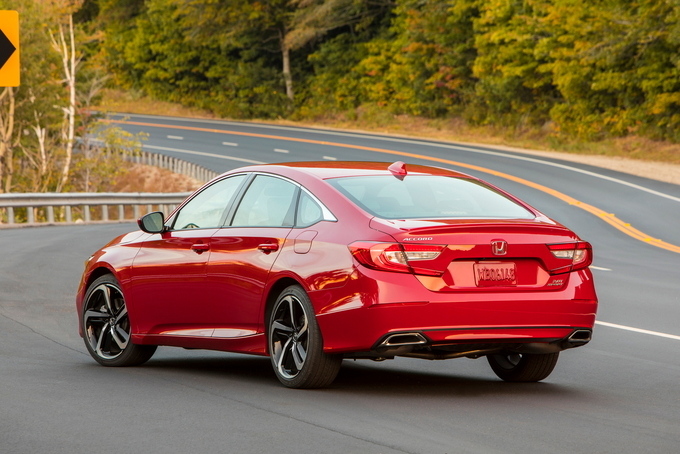 Honda offers its full Honda Sensing suite of safety features on every Accord as standard. The suite comes with adaptive cruise control, lane departure warning, lane keeping assist, forward collision warning with automatic emergency braking, automatic high beams, and traffic sign recognition. 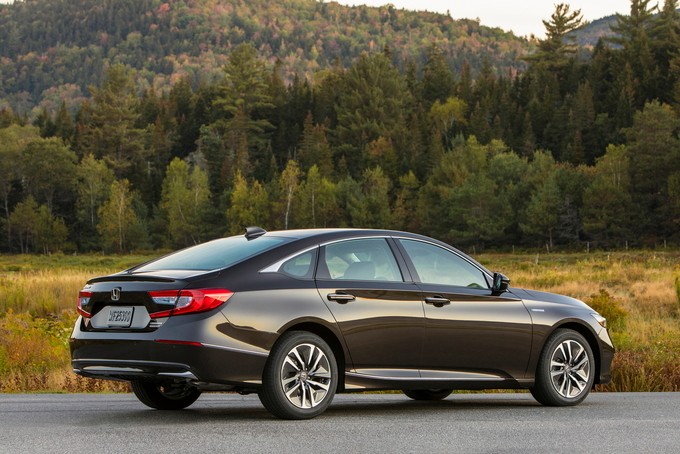 If you move up to an Accord above the LX or the Sport trim, the sedan comes with blind-spot monitoring with rear cross-traffic assist as standard. Pricing for the entry-level LX trim starts at $24,615 (all prices include the $895 destination charge). Standard exterior features for the trim include 17-inch wheels, power side mirrors, LED taillights, and automatic LED headlights. The cabin features dual-zone automatic climate control, push-button start, a tilt-and-telescopic steering column, a seven-inch screen, a four-speaker audio system, Bluetooth, and cloth upholstery. The Sport trim is the next step up and is priced at $27,075. A six-speed manual transmission is standard for the trim, while a CVT is a no-cost option. Going with the 2.0-liter turbocharged four-cylinder engine is an extra $4,530 with either the six-speed manual or 10-speed automatic transmission. Features found on the Sport trim that aren't on the LX include 19-inch wheels, chrome exhaust finishers, LED fog lights, a rear spoiler, a leather-wrapped steering wheel, sport pedals, a 12-way power-adjustable driver's seat, an eight-speaker audio system, an eight-inch touchscreen, and Apple CarPlay and Android Auto. Ticking the box for the more powerful engine also brings a driver-side seat back pocket, a power moonroof, heated exterior mirrors, and smart entry with walk away auto lock as standard. 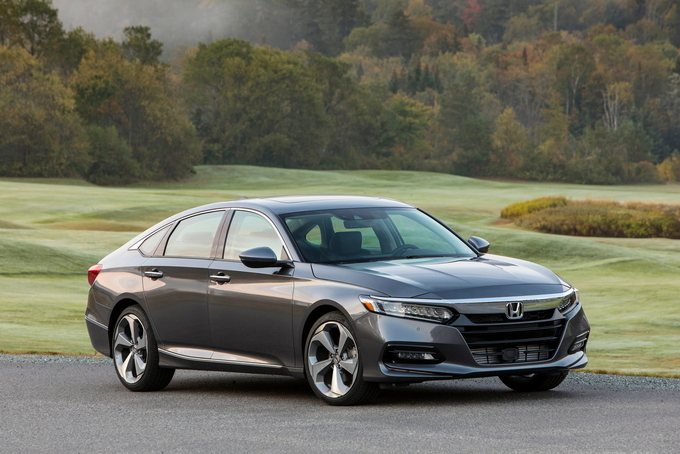 The mid-range Accord EX starts at $28,515. The trim comes with smart entry with walk away auto lock, heated exterior mirrors, a power moonroof, an active shutter grille, a driver-side seat back pocket, SiriusXM Radio, and an HD Radio. Carrying a price tag of $31,015, the EX-L trim is the next step up. Adding the turbocharged 2.0-liter four-cylinder and 10-speed automatic is an extra $2,000. Standard equipment over lower trims includes a HomeLink remote system, an auto-dimming rearview mirror, a four-way power front passenger's seat, leather-trimmed seats, a 10-speaker audio system, and navigation. The Touring is the range-topping trim that starts at $36,845. The Touring trim comes with the turbocharged 2.0-liter four-cylinder engine as standard. A head-up display, ventilated front seats, a wireless phone charger, mobile hot spot capability, heated rear seats, and rain-sensing windshield wipers are standard. Without any optional packages to worry about, getting into a 2019 Honda Accord that has everything you want is as simple as looking at the vehicle's list of standard features. While the 2.0-liter turbocharged engine is a great motor, we'd stick with the 1.5-liter unit, as it brings better fuel economy numbers. This makes the mid-level EX trim the most attractive option in our eyes. Carrying over from last year's all-new model, the 2019 Honda Accord offers excellent driving dynamics, a handsome exterior, generous rear seat room, and a wide range of standard active safety features. Our complaints remain few – a less-than-stellar six-speed manual transmission, a small turbocharged engine that runs out of steam when pushed, and the lack of a touchscreen or smartphone compatibility on the base model. The 2019 Accord starts at $24,640 for the base LX trim, a $180 increase over 2018, while pricing for the top-shelf Touring model begins at $35,910. The base engine for all but the Touring model is a 192-horsepower, 1.5-liter turbocharged four-cylinder paired with a continuously variable transmission (CVT), or a six-speed manual on Sport models. Optional on Sport and EX-L, and now standard on the Touring trim is a 252-hp, 2.0-liter turbo that's borrowed and detuned from the Civic Type R. A six-speed manual is still a no-cost option on the Sport, although Honda swaps out the CVT for a 10-speed automatic on both EX-L and Touring models. Aside from an engine choice on Sport and EX-L models (the four Hybrid models are covered separately), all trims are monospec. Even the base model includes automatic LED low-beam headlights with high-beam assist, alloy wheels, dual-zone automatic climate control, push-button start, a seven-inch touchscreen, Bluetooth, and a rearview camera. The Honda Sensing suite of active safety gear is standard on all models and includes adaptive cruise control, forward collision warning, automatic emergency braking, lane keeping assist, and lane departure warning. Our choice would be the EX trim that includes Apple CarPlay and Android Auto capability, a power driver's seat, eight-inch touch screen, a 60/40 split to the folding rear seatback, and a more powerful audio system from the Sport model, and adds such niceties as remote engine start, heated outside mirrors, a moonroof, heated front seats, and the final piece of active safety: blind-spot monitoring with rear cross-traffic alert. The smaller 1.5-liter turbo engine matches up well with the CVT automatic and, tuned for low-end performance, steps briskly off the line; the bigger engine also works better the automatic – a conventional 10-speed. Both take advantage of an adjustable-ratio steering system that's quicker at the edges for responsive cornering, but more relaxed during highway cruising. The ride is smooth and composed, especially on the adaptive suspension-equipped Touring model. At the same time, the 1.5-liter turbo, tuned for off-the-line bursts, runs out of breath quickly, while the six-speed manual feels like an afterthought with a high takeup, overly-light clutch pedal, and long shifter throws. Finally, ride quality takes a back seat to appearance with the Sport's 19-inch wheel and tire combination. Unchanged from last year, Honda joins Mazda by pulling off what other Japanese automakers haven’t: a taught design, in the right proportions, lacking excess bright trim – on most models. It starts up front, borrowing the lights from Acura but adding a more stylish grille. Along the sides, thin pillars and graceful sculpting give it a class-above appearance, and the design is finished off with a sportback-shaped tail treatment. Inside, occupants are treated to supportive seats, clear and intuitive instrumentation, an expansive view courtesy of thin roof pillars, a low nose, a low horizontal dashboard, and active noise cancellation that, on EX and higher models, is augmented by wheel resonators that quiet tire noise. Fit and finish is excellent and, despite an overall length two inches shorter than the previous generation, a longer wheelbase and increased width translates to comfort for up to five adults, with extra points given for 40 inches of rear leg room and 16.7 cubic feet of trunk cargo volume. Nits are few. Top trims have a bit too much chrome, and the base model's cloth seats don't seem especially durable. 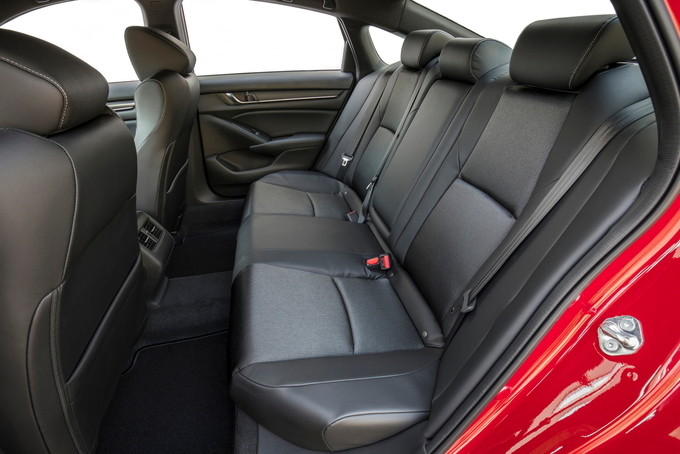 While despite ample leg room in back, shoulder room with three passengers is tight, and the moonroof, standard on EX and higher trims, reduces the available head room and could prove to be a problem for passengers with tall torsos. 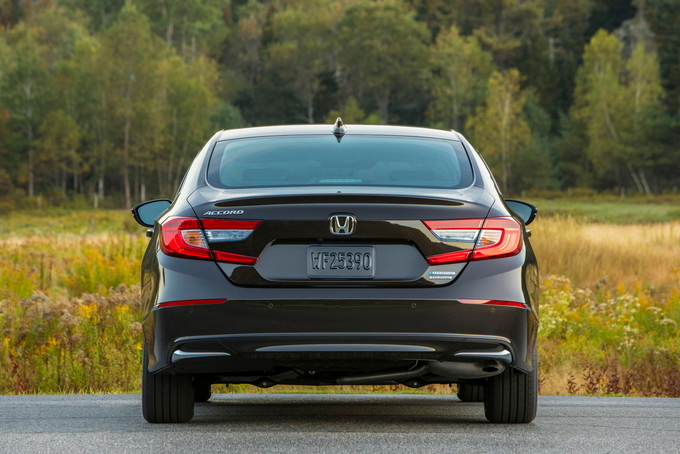 We appreciate the Accord's combination of design, advanced safety features, and value proposition. Keeping it from perfection is a wonky six-speed manual, a sport suspension tuned for firmness over ride quality, and a base model that skips a touchscreen with smartphone compatibility. 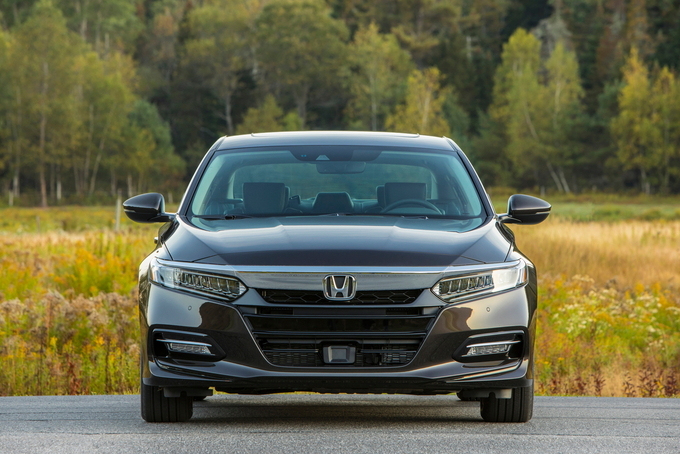 Families should set aside any bias toward crossovers and check out the latest Accord. Enthusiasts won't embrace the finicky six-speed manual or a ride skewed toward comfort. 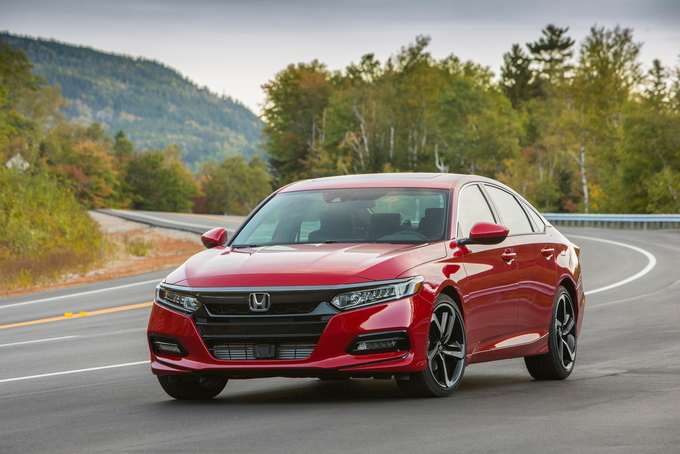 Despite a finicky manual, the base model's lack of a touchscreen, and a base turbo tuned for efficiency over performance, the 2019 Honda Accord's stunning looks, smooth automatics, and plethora of advanced safety features make it a top pick in the mid-size class. We have partnered with trusted dealers in your area to give you a great price on the new Honda Accord.